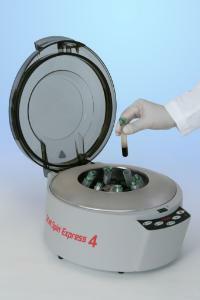 This high-speed horizontal centrifuge provides faster turnaround time and greater productivity. To simplify operations, the unit features three time settings for three, five, and ten minute procedures. Lid remains locked until the rotor completely stops, and an audible alarm sounds when the cycle is complete. Adapters allow the centrifuge to accommodate tubes from 1.5–10 mL. Certifications: UL and cUL listed. CE marked. Ordering information: This centrifuge includes eight-place rotor, eight 7 mL inserts, eight 10 mL inserts, manual latch release tool, hex key tool, and power cord.